Cooks' Cottage, previously known as Captain Cook's Cottage, is located in the Fitzroy Gardens, Melbourne, Australia. 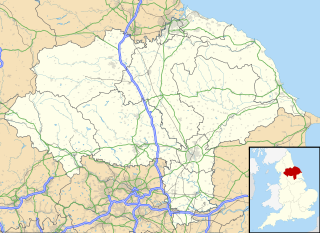 The cottage was constructed in 1755 in the English village of Great Ayton, North Yorkshire, by the parents of Captain James Cook, James and Grace Cook, and was brought to Melbourne in 1934 by Sir Russell Grimwade. 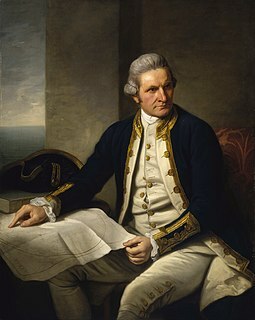 It is a point of conjecture among historians whether James Cook, the famous navigator, ever lived in the house, but almost certainly he visited his parents at the house. The inside of the cottage includes centuries-old antiques and is stylised in the way of the 18th century, as are the clothes of the volunteer guides. In 1933 the owner of the cottage decided to sell it with a condition of sale that the building remain in England. She was persuaded to change "England" to "the Empire", and accepted an Australian bid of £800, by Russell Grimwade, as opposed to the highest local offer of £300. The cottage was deconstructed brick by brick and packed into 253 cases and 40 barrels for shipping on board the Port Dunedin from Hull. Cuttings from ivy that adorned the house were also taken and planted when the house was re-erected in Melbourne. Grimwade, a notable businessman and philanthropist, donated the house to the people of Victoria for the centenary anniversary of the settlement of Melbourne in October 1934. The cottage immediately became a popular tourist attraction. In 1978 further restoration work was carried out on the cottage. An English cottage garden has been established around the house, further adding to its period reconstruction. Very few of the items in the house are from the Cook family, but all are representative furnishings of the period. The cottage features in two scenes of the 2012 movie Any Questions for Ben?. Stewart Park, Middlesbrough – site of the cottage where Captain James Cook was born. ^ "CAPTAIN COOK'S' COTTAGE HANDED OVER : Presented To Victoria By Mr. Russell Grimwade: "PRECIOUS RELIC SET IN OLD=WORLD GARDEN"". The Advertiser. Adelaide. 16 October 1934. p. 16. Retrieved 6 September 2017 – via National Library of Australia. ^ "CAPTAIN COOK'S COTTAGE: Presented To Victoria By Mr. Russell Grimwade". The Chronicle. LXXVII (40, 166). Adelaide. 18 October 1934. p. 49. Retrieved 6 September 2017 – via National Library of Australia. ^ "Deeds of Captain Cook's Cottage". The Argus (27, 801). Melbourne. 26 September 1935. p. 10. Retrieved 6 September 2017 – via National Library of Australia. ^ Davidson, Helen (23 January 2014). "Captain Cook's cottage vandalised with graffiti referencing Australia Day". The Guardian. Retrieved 6 August 2017. ^ a b c d The Captain Cook Society: Cook's Log, page 212, volume 6, number 3 (1983). ^ a b "Cooks' Cottage". City of Melbourne. Retrieved 6 August 2017. ^ "CAPTAIN COOK'S COTTAGE. :ANOTHER CENTENARY GIFT.:Mr. Russell Grimwade's Generosity". The Argus (27, 105). Melbourne. 1 July 1933. p. 21. Retrieved 6 September 2017 – via National Library of Australia. Cremorne is a small inner suburb of Melbourne, 2 km south-east of the CBD. Its local government area is the City of Yarra and at the 2016 Census it had a population of 2,018. It is bounded by the Yarra River, Punt Road, Swan and Church Streets, and divided down the middle by the railway to South Yarra. Covering only about a square kilometre, until 1999 Cremorne existed only as a locality in the larger suburb of Richmond. Cremorne's charm is in its rather chaotic mix of uses and the unique character resulting from being 'walled in' by main roads and railways on all sides. There are industrial icons such as Bryant and May and Rosella factories, and the Nylex Clock, side by side with Victorian cottages, modern townhouses, offices and light industries. The Fitzroy Gardens are 26 hectares located on the southeastern edge of the Melbourne Central Business District in East Melbourne, Victoria, Australia. The gardens are bounded by Clarendon Street, Albert Street, Lansdowne Street, and Wellington Parade with the Treasury Gardens across Lansdowne street to the west. La Trobe's Cottage is a historic cottage in Melbourne, Victoria, Australia, built in 1839 by the first Superintendent of the Port Phillip District of New South Wales, Charles La Trobe, and his family. The National Herbarium of Victoria is one of Australia's earliest herbaria, and the oldest scientific institution in Victoria. It was established in 1853 by Ferdinand von Mueller, the Government Botanist for Victoria, and is situated within the Royal Botanic Gardens, Melbourne. The present building was constructed in 1934 through a donation from philanthropist Sir Macpherson Robertson. It, along with a 1989 extension, houses the entire collection of 1.5 million plant and fungal specimens. The Herbarium's botanic library is an important source for the history of Australian botany, and has contributed some 124 volumes to the online digital Biodiversity Heritage Library. Centenary Hall is a building within the Melbourne CBD in Victoria, Australia, on the corner of Exhibition Street and Little Collins Street.